Good question Pug. I can't really say my mind takes me anywhere in specific. It's more of a feeling. Melancholy, definitely. What do you see or feel? This one makes me feel hopeful. Apt title. I definitely feel the music.. I have always been that way when it comes to music. I remember reading the results of a of a study once and they found out that some people have a more developed or active part of the brain that processes and responds to music. I think I'm in that group. Also, the pictures that accompany the songs like that also can take me to that place. In my minds eye I can feel rain as I walk down that street, smell it.. hear raindrops on the umbrella. I really enjoy it when my mind takes me away like that. I think I remember reading about that some time ago as well. I definitely feel. I personally find music to be the superlative art form for this reason. No other art form comes close to making me feel the way music does. I agree about pictures and imagery supplementing music. They can really change the feeling of a song. Sometimes I even avoid music videos because I know they will change that "feeling" if I watch them. Other times, I may watch something and it will improve the music. I love the fact that we live in the age of the internet. I am exposed to so many types of music every day. In another life, I would have been a musician. Hell, I still can be one in this one. But I'm pretty damn busy these days. One day I hope I find the time. I love the thought of being in love..
Hopefully one day I'll experience it.. I wanna go there... now! 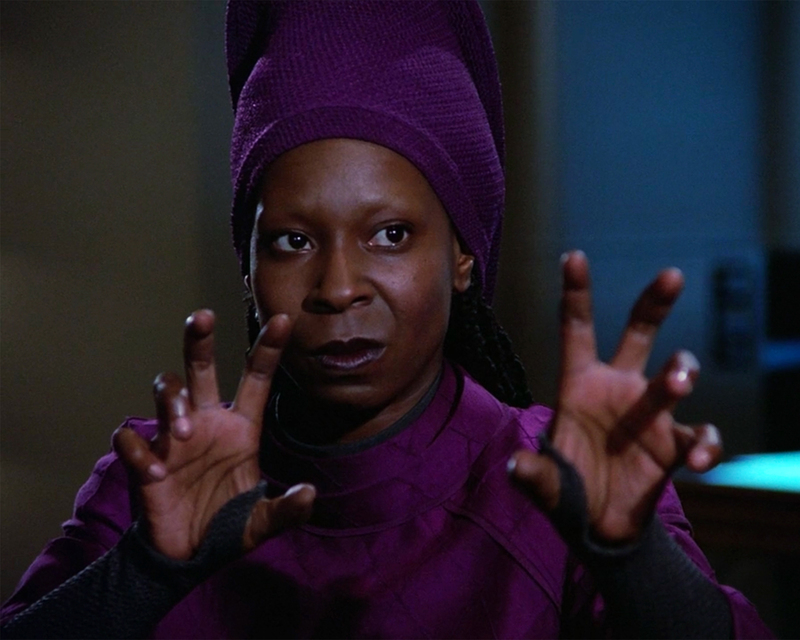 Initially in TNG, Guinan is attempting to ward off Q with that pose. They are old enemies I guess. But Guinan's pose is suggestive of... grabbing... um... things..... (see pic of Seven of Nine).